A hostel has recently opened in the midst of the Chernobyl exclusion zone that is located in Ukraine. This zone is the area that was contaminated as a result of the Chernobyl NPP accident that had happened in 1986. It covers about 2,600 square kilometers. One should note that it is acknowledged to be highly dangerous. The hostel is meant for those who go on excursions to the Chernobyl zone. Local public authorities claim that due to large numbers of tourists such accommodation is in great demand here. The hostel was organized in the former dormitory. Today there are 42 single rooms. All of them are equipped with single beds, plasma TVs, toilets, shower units. The guests can also use Wi-Fi for free. When the renovation is finished, the hostel will be able to welcome 102 tourists. They will have the opportunity to choose between single and double rooms. As of today, to stay at the hostel for one night, one is to pay 198 hryvnias (UAH), which equals $7.60. Add the two days tour you can here. According to the administrator of the hostel, guests come from different countries, even from remote ones. He also notes that, as a rule, there are almost no vacant rooms. The representatives of the agency organizing excursions to the exclusion area say that a new hostel is aimed to provide tourists with comfortable conditions. Those who want to visit the exclusion zone should follow a few rules. One can stay in the zone for a short period only. One cannot enter it without permission. One will not be allowed into the area without a special guide. On 7th of June 2017 in Chernobyl was opened new Chernobyl Hostel Polissya in order to improve quality of accommodation for foreign tourists in Chernobyl Zone. Chernobyl Hostel Polissya is designed for 100 beds for short-term accommodation in Chernobyl Zone. International tourists have all conditions for comfortable living: plasma TV, shower, toilet, furniture in each single or double room, free Wi-Fi Internet. 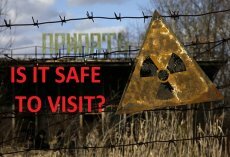 Important to know that to book the hostel is possible via one of Chernobyl tour operators in Kiev and stay in Chernobyl Hostel Polissya do not let tourists explore Chernobyl Zone independently - only in organized tours. In the evening time it is possible to visit only center on Chernobyl city and a grocery supermarket.